Our tree is decorated! Well, it's a start. It's a new tree and we weren't sure how many decorations would fit on it so we started with some silver baubles and will add to our collection over time. Most of our decorations are silver with a few touches of gold and we are thinking of adding some red into the mix. Here are a few of the decorations that have inspired my wish list! Aw, you guys are the cutest! And way to go - the tree looks absolutely awesome!! We're hoping to put ours up this weekend!! 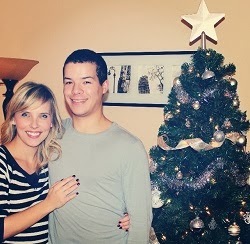 Love these shots, the tree looks beautiful and you two are so sweet together!! You two are adorable! I love your tree, I used a similar color palette with my tree! Lovely tree! I used to do mine in silver and gold and loved it!